These jars are so cute! I do a lot of canning and I usually buy my jars at Walmart, but these jars caught my eye because of the shape and the decorative lids. I’m glad I gave them a try. I made strawberry jam this morning using the fresh strawberries from my garden. I bought the jars because I like to give away my jams to family and friends. Always before, I had to decorate the lids with a circle of fabric and a ribbon to make them pretty, but the lids for these jars are adorable…a red gingham! I also like that the jars are straight up and down, not tapered, because I put cute little sticker labels on them. When the jar is tapered, the labels don’t go on right.Canning with these jars was easy. They fit into the wire can holder and into my grandmother’s old canning pot just like any other jar. I didn’t have any crack or break. I like that the lids are one piece and no the two-piece ring and dome lids. I have only ever canned with the ring and dome style lids so I was a bit worried that the jars wouldn’t seal right, but they did! Only one jar didn’t seal…but that just means we get to eat that one right away! I was also wondering if the paint on the lids would come off in the boiling water, but that didn’t happen either. The lids and the jars all came out of the water bath perfectly.I don’t know if the lids can be reused. I didn’t see that information on the manufacturer’s info. But I am used to buying new domes when I can so I would just plan to buy new lids.Now that I have tried these jars, I plan to order more in different sizes for green beans, peaches, and apple butter. I even want to try canning homemade pesto. These jars would be perfect for that. These jars are great! Have been trying to find 2 oz jars for canning baby food. So many kinds are not suitable for proper sealing. These sealed great and held up in the pressure canner. Tonight I tried canning puréed peaches, can’t wait to buy more and can butternut squash and apples for my son. I’ll also use these for puréed peas once ready to harvest. Thank you! For anyone with even a passing interest in jam, these jars are a must-buy! 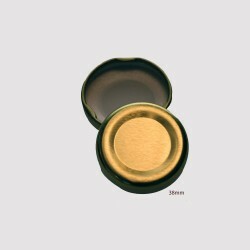 Durable, stylish, and multi-purpose, the jars are a superb value. Whether jamming is a side hobby or a full-on obsession, these jars will be with you, through and through.The charming plaid aesthetic is easy on the eyes, and adds a lovely accent to kitchens both young and old. But enough talk- that jam isn't going to jar itself. Order Klean Shop Jam Jars and you'll be enjoying delicious jam for the foreseeable future! These are definitely a MUST buy! First, they are the cutest jars you will find. I love the red gingham lids and will be buying the blue next. I love the size of them too! I used a few for the jam that I made. I am a teacher and also used some to organize my school supplies such as my push pins, clips, and binder clips. The lids go on great and are secure. I will be using the rest of them for the rest of the jam I made and ordering blue ones for my classroom too. They are so reasonably priced for such high quality! I’m an avid canner but I struggle to find cute jars that are also functional. When I came across these Klean Shop Jam Jars, I can’t explain how excited I was. The product was shipped fast and packaged well. Upon further inspection, I was able to determine that they are in fact a high-quality product - no ill-fitting lids or scuffed up glass. A few of my pepper plants were ready to be harvested so I loaded these jars up with a pickled pepper medley that I plan on gifting to some friends (and keeping one or two for myself of course!) These jars really do offer the best of both worlds though, style and functionality. I’ll be ordering the blue jars once my currants are ripe just for a little contrast in appearance. Definitely more than satisfied with my purchase! Really nice jars. Got them for daycare. Like the single piece lid and design. These jars arrived in perfect condition, at lightning fast speed. I like that they are different than a typical Mason jar. I ordered them for my pantry storage of smaller items. I will say however, like others have mentioned, the lids are not super tight. I won't be storing anything that is liquid in them, as I do believe they may leak. They are perfect for dry goods (which is my intention), or maybe candle making, but the lids may be sketchy for liquid. Very pretty jars for organizing. I took one star off for the lid sealing. These jars work very nicely. I was making jam as party favors for 80 people for a 90th birthday celebration and wanted jars that were more substantial than a 1-1.5 ounce without using a full sized 4 ounce canning jar. They were overall nicely made, sealed well, held up in the boiling water bath sealing process and looked great. The reasons I couldn't give 5 stars: (1) 2 jars (out of the 4 cases I purchased) had imperfections in the rim of the glass and couldn't be used as the glass would not contact the sealing surface. (2) An additional 2 jars did not seal properly... but hey... as another reviewer pointed out - more jam for me! (3) They were NOT 2 ounce jars. They were 3+ which meant I needed to make one more batch of jam than I was planning. So if you are looking for 2 ounce... these are bigger than you want. In the final analysis I loved the jars and would consider buying them again. Giving food gifts depends 75% on presentation and the Klean Shop Jam Jars are the only jars I’ve found so far that fit the bill totally for suitable gift giving. Once people see the red and white gingham top and the pattern in the glass, they know that a lot of thought went into the gift, even down to the selection of the jar. The glass is high quality and thick. The jars are airtight and watertight.Last month I made loquat fruit preserves and wish I had these jars back then. I wanted a sample to give friends and businesses I work with but the only jars available were standard jars. I ended up giving 8-16 ounces of the fruit preserves to people risking they might not like it. It could have resulted in a lot of time and effort and the preserves getting tossed. With these 4-ounce jars, it would have worked out a lot better. These jars come in different sizes from 2 ounces on up to 12 ounces.I love that the jars are watertight because I can put them in a cooler with ice that will melt and the food in the jars won’t become waterlogged. So tired of this happening in the past and relieved that someone already solved this issue.Another thing I really like about these jars is that they can be put in the oven. I’d like to try roasting garlic in them next because I needed some type of glass container to put them in that can be covered. These jars and lids can take the heat of the oven so I will soon have spreadable garlic for guests.I made little chocolate cups with the jars where I layered almonds, chocolate, ginger, and cherries in them and froze the dessert. The pictures uploaded don’t give you a good enough sense of how well the recipe turned out and how much my friends loved it as a gift. They now want to buy these jars, too! I never heard of a jar going viral on the internet but if there was one that did, the Klean Shop Jam Jars would be it!My order came quickly and the jars were individually wrapped in bubble plastic, showing that the company really cares for their product.The Klean Shop Jam Jars are something everyone who has a functional kitchen needs! The Rex 290ml Multi Faceted Jar has 12 panels. Pickles can be elegantly presented, whilst jams and conserves are enhanced by the light shining through the multiple panels. All Rex jars are absolutely free of plasticizers and heavy metals. 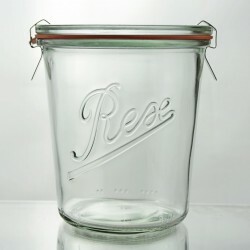 12 x 80ml Weck Mini Tapered Jars - 080 - includes glass lids, seals and clamps80ml Weck Preservi..
12 x 160ml Weck Tapered Mini Jar - #760 - includes glass lids, seals and clampsWeck reusable Gla.. Whites Easi Ties are cost effective, soft and gentle and very easy to use plant ties. Easi Clip..